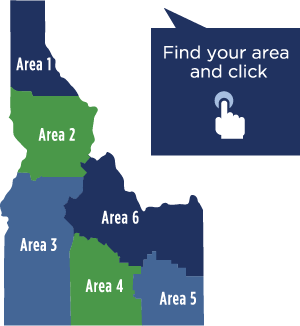 The Idaho Commission on Aging (ICOA) was created in 1968 and receives funding from both the Federal and State governments. Services are prioritized to help those most at-risk, based on various factors. The ICOA assists older adults and people with disabilities to remain independent, avoid institutionalization and age in place in their own homes and communities of choice. Goal 1: Support Older Idahoans to live independent and healthy lives in the communities of their choice. Goal 2: Promote safety, self-determination and dignity for seniors and vulnerable adults. Goal 3: Champion an effective and efficient community-based aging service network. We can use the area map below to find the nearest provider or referral agency.